Arno Viljoen Attorneys is a dynamic law firm dedicated to provide our clients with consistent excellent service, focusing on all aspects of Property law and Conveyancing. We strive to exceed our clients expectations and aim to achieve and maintain the highest standards of integrity and professional excellence. We view our clients as long-term investors in our legal practice and aim to build lasting relationships between attorney and client. 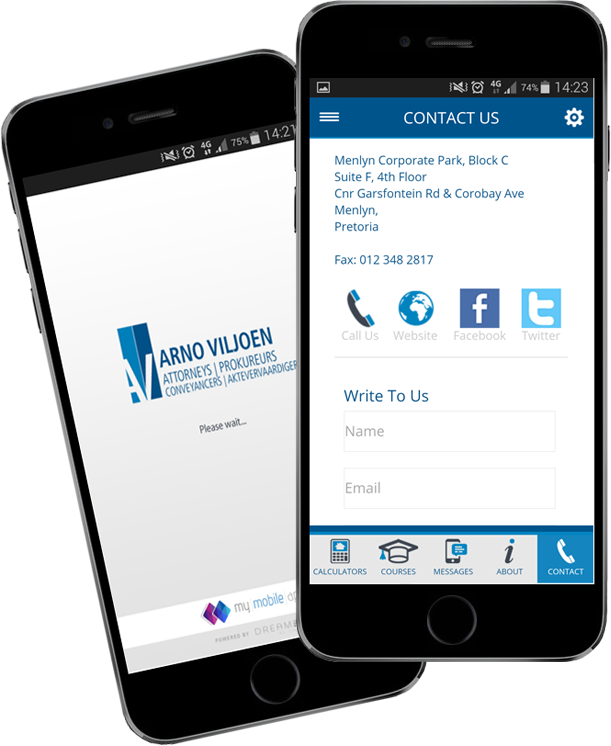 From our inception Arno Viljoen Attorneys has developed into a leading law firm providing a wide range of services and advice to our corporate as well as individual clients in the property law field. Our property department has been serving major banks and is assisting with the registration and cancellation of bonds. Our clients also include Property Developers, Estate Agents and Mortgage Originators to whom we offer a complete property law service including conveyancing. We have from our inception focussed our efforts and marketing strategy to build solid and lasting business relationships with all our clients. We understand the challenges of the Conveyancing process and are utilizing our vast experience and knowledge in this field to provide excellent service and results to all role-players in the property industry. We market our firm on the basis of our values of Personal, Professional and Effective service.Our marketing strategy has been built on three pillars: brand awareness, training and technology. We are constantly increasing our efforts in all three areas to keep up with the ever changing property market and our clients specific needs. We are motivated to grow and expand our firm in a healthy and organic way always keeping our level of services delivery on the same level that has assisted us to grow to our current level. Although we have all heard the word capital gains tax (CGT), there seems to be some grey area in understanding it. When submitting your annual income tax return, any gains or losses based on a transaction during that period must be declared and submitted. SARS considers the first R2 million gain on the sale of a primary home as CGT exempt, homeowners who use part of the home for business may be liable for different tax structures. CGT is not a separate tax but forms part of income tax, which is taxed at a lower effective tax rate than ordinary income. Capital Gains Tax is basically a tax on the resale of assets. Anyone that disposes or sells their fixed assets, or following the death of the asset owner, is liable for CGT. When submitting your annual income tax return, any gains or losses based on a transaction during that period must be declared and submitted. “This is where the confusion can occur and it is up to the taxpayer to prove that certain sums were capital, and not revenue. For instance if a property was intentionally purchased with the idea of generating a profit, it would be considered as revenue. But if the intention was as a financial investment, this would be capital,” explains Craig Hutchison, CEO Engel & Völkers Southern Africa. Investors need to ensure they keep proof of their objective of purchasing the asset to avoid the normal revenue tax. SARS is at liberty to question the objectives of the investor if there are frequent property transactions, and might very well consider this as a revenue tax. If the homeowner keeps the property for personal long-term capital growth, SARS will see any profit on this as a capital gain. There are many tax tests implemented by SARS to determine whether to implement a capital or revenue tax. For instance, if the buyer purchased a home for personal use (primary residence) this will be exempt from CGT, with certain limitations. SARS considers the first R2 million gain on the sale of a primary home as CGT exempt. Homeowners who use part of the home for business may be liable for different tax structures. If homeowners understand the basic difference between capital and revenue gain then at least half the battle is won, as everyone always strives to keep their payable tax to a minimum. If you are selling property or intending to, it’s best you read up on whether or not you need to pay CGT on the profits you make. When did CGT come into play? Instituted in South Africa on 1 October 2001, this date is considered the “valuation date”, and only gains made on a property from this date are liable for CGT. This means that while any individual selling a property is liable for CGT, the value on which CGT will be calculated will be based on the value of the property as at 1 October 2001, and the gain made from this date, up to the date of sale. Any profits accrued from this date onwards on the sale of specific capital assets will be taxed with CGT. Who is liable to pay CGT? Taxpayers, including individuals, trusts, companies and close corporations, will be taxed on the profit they make when they sell an asset or property. A resident, as defined in the Income Tax Act 58 of 1962, is liable for CGT on assets located both in and outside South Africa. A non-resident is liable for CGT only on immovable property in South Africa or assets of a “permanent establishment” (branch) in South Africa. Certain indirect interests in immovable property such as shares in a property company are deemed to be immovable property. Some persons such as retirement funds are fully exempt from CGT. Public benefit organisations may be fully or partially exempt. Normal rental income from a property is revenue, which is declared on your annual income statement and therefore not subject to CGT. CGT becomes payable when you receive your income tax assessment (IT34). As a registered taxpayer you will simply declare your capital gains and losses in your return of income covering the relevant year of assessment. Keep the records necessary to determine a capital gain or loss in a safe place as many years may elapse, between the time you acquire an asset and dispose of it. If you are buying South African immovable property from a non-resident seller you must complete form NR02 and an IRP6(3) using the sellers income tax reference number and withhold the tax at the rate prescribed in section 35A(1). You may withhold at a lower rate of tax if the seller supplies you with a tax directive from SARS authorising you to withhold at a lower rate. You must then submit the NR02 and IRP6 (3) together with your payment to SARS. If the seller is not registered for income tax, the NR02 and offer to purchase must be forwarded to nres@sars.gov.za, so that the seller can be given an income tax reference number before payment is due. A non-resident seller of immovable property may be entitled to request that tax be withheld at a lower or even zero rate under section 35A(2). The reasons why a sale would attract a lower rate of CGT will depend on the facts of the particular case, for example, the person may be fully exempt from CGT, such as a foreign state, or in the case of an individual, having a lower level of taxable income or have disposed of the property at a loss. To request a tax directive you must complete form NR03 and submit it together with the offer to purchase, tax calculation and supporting documentation to nres@sars.gov.za or use one of the other submission methods described on the form. For the purposes of provisional tax a taxable capital gain is excluded from the basic amount. If you are not permitted to use the basic amount for the purposes of your second provisional tax payment, you will have to take into account any taxable capital gain that arose or will arise during the year of assessment in estimating your taxable income. Likewise, a taxable capital gain must be taken into account when making any third topping up provisional tax payment. · within 28 days of the date on which the amount was withheld by a non-resident buyer. The above will all be managed by the conveyancing attorney managing the transfer of the property. While this is a very broad overview of what to expect when it comes to CGT, it is always advisable to seek professional assistance to ensure all regulations are complied with and calculations are done accurately, says Hutchison. Updated transfer duty now included in the transfer costs calculator. Share a comprehensive cost calculation directly from the transfer and bond calculator on the App via e-mail with your clients. Updated property search functionality which now includes direct access to property portals, associated estate agents, bond finance and other property services, from the App. Download or update now on iOS and Android.